This month's issue of BJI contains three trip reports: Plaza and El Cortez (by Stu D. Hoss); Tropicana and MGM Grand (by KC Brooks); and downtown casinos (by JPB). You'll find some very good blackjack games in these trip reports (and also some duds to avoid). Also, if are planning a trip to Vegas for only a quick weekend of play, JPB makes a good point as to why it makes sense to play the blackjack games downtown. Zengrifter received several comments from readers on his Part 1 and 2 trip reports to the casinos in Blackhawk, CO and this month he answer's them. If you tried answering the questions on the Blackjack Ball Test (last month's issue of BJI), you can now grade yourself against the answers contained in Part 2 of my Blackjack Ball Report. This is a BJI exclusive... you won't find this anywhere else! Dustin Marks continues his story on how he became a blackjack cheater, and Paul Wilson reminisces about the good ole days at the soon to close Riviera Casino and Hotel. Royal Flusher continues with his Las Vegas trip report, where you will find the good and the bad video poker games and the best places to eat and stay in Las Vegas (with photos). If you play in blackjack tournaments (or planning to), don't miss reading Monkeysystem's article containing strategies for playing the last hand in a tournament. Last, but not least, we have a run down on the upcoming major blackjack tournaments across the USA courtesy of blackjacktournaments.com. This article, which appeared in issue 109 of the BJI, shows how it's possible to get the edge at a 6-5 blackjack game. We have strategy cards for basic and advanced blackjack players (developed by Ken Smith), and for video poker players (by Dancer/Daily). These strategy cards are mathematically accurate, easy-to-use, and casino legal. You'll always have the correct play at your fingertips if you use them in the casino. They also make great gifts. 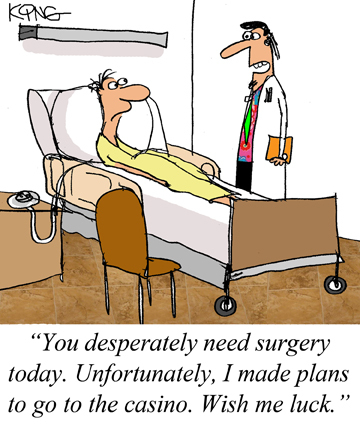 Check our online catalog for discounted prices. The ultimate Blackjack teaching tool! It's not a game: it's an easy and fun instructional program that will help you remember proper playing strategy at the casino tables. 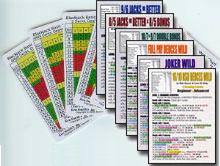 Blackjack Mentor is an instructional aide to help you become a better Blackjack player. If you want to win at Blackjack, you need to know the right action for each hand combination. 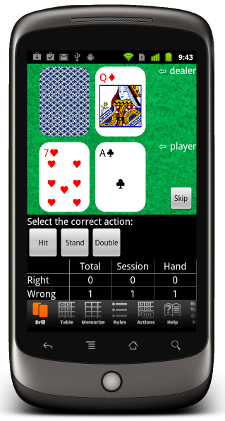 Blackjack Mentor has six modes to make the process of learning the right plays fast, easy and fun. 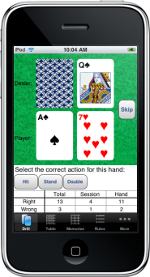 Blackjack Mentor runs on all Android, iPhone and iPad devices. "I marched into the "madness" that is Fremont Street to check out a couple of downtown casinos for this month's issue. If you want to know more, please read on, but be advised..."
"Blackjack at the Trop consists of double-deck and six-deck shoe games. There are three tables of double-deck blackjack with the following rules..."
"In this whirlwind trip, I took a fresh look at the blackjack games in the downtown casinos and gained a new appreciation of downtown Vegas in the process..."
"This month I reviewed several questions I received from my first two trip reports..."
"An insider's report on the recent Blackjack Ball including the challenging test questions with the answers..."
"I got a job on the Las Vegas Strip dealing blackjack. I had my first agent come in and we took off the game. I was primarily stacking the deck. We won without any heat, and this gave me tremendous confidence..."
"In this month's column, I'm going to remember the Riviera and share some gambling lessons and memories that I learned when I used to frequent this property in the early 1990s through the mid-2000s..."
"Savvy, video poker player Royal Flusher's trip report, which includes his humorous, tongue-in-cheek take on the true events (good and bad) that happened..."
Read Royal Flusher's complete article. "This month I will examine two important considerations in final tables and their implications for playing strategy: prize distribution, and using 'The Twist'..."
"Check out the schedule of upcoming major blackjack tournaments by region in our Blackjack Tournament Report..."